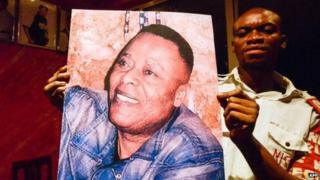 At least 14 people have been crushed to death in a stampede at a tribute festival for Congolese singer King Kester Emeneya. Officials said "a rush due to the enthusiasm of the audience" took place in the singer's home town of Kikwit in the Democratic Republic of Congo. Some reports said 21 people had died. Thousands attended Emeneya's funeral near Kinshasa in March. He died the previous month in Paris, aged 57, from heart problems. The festival, which was due to continue until Sunday, has now been cancelled. "The provisional toll, which we deeply regret, stands at 14 dead - including two policemen - and eight wounded," said Camille Sesep, a spokesman for Bandundu province. "The government is busy taking charge of the victims," he added. Some survivors at a hospital in Kikwit - about 500km (300 miles) from the capital Kinshasa - said a power cut at the festival had triggered a rush to the exits, Reuters reported. Correspondents say Emeneya was an innovative musician who introduced electronic instruments such as the synthesiser to Congolese music.